One of several traditional Swiss La Bleues from La Valote, Môtiers. From Val de Travers, Switzerland - after 90 years of prohibition, the Suisse La Bleues are yet again legally distilled. Many of the formerly clandestine distillers now distill their age old variations legally. This one comes from a small distillery in Moitiers, Val de Travers. 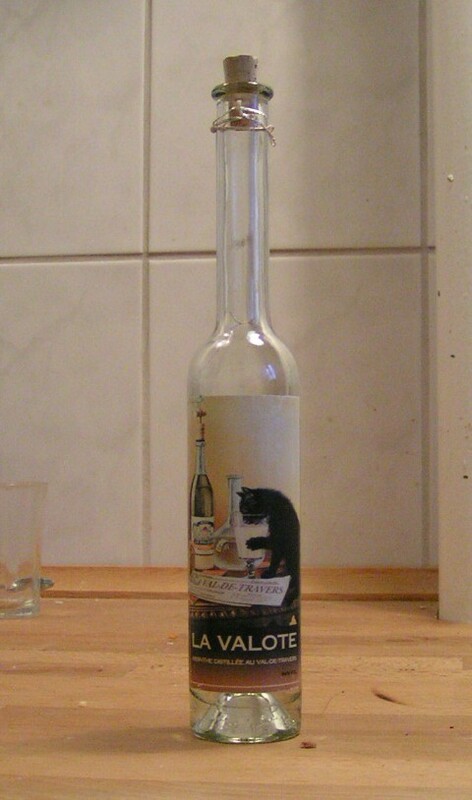 I obtained this, and the other two La Valote absinthes from my danish absintheur friend, "Gertz". So, how about the drink then? First impression of this one was very similar to most La Bleues. Rahter heavy on the fennel with a wormwood background. Anise present but not obtrusive. 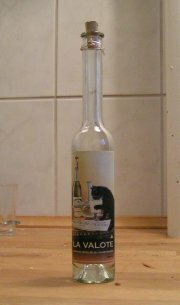 The perfectly clear absinthe had a rather simple aroma but it was actually quite promising. Adding water produced a very thick fine louche and the absinthe turned perfectly milky thick and white. This did release a more floral aroma, but still not as much as I'd expected. The taste is equal to the expectations from the aroma. It was not very complex but the composition was finely tuned and it was a refreshing drink. I'd say this one was quite ordinary in taste and it would probably benefit from additional work but how do you tell that to someone who's made this absinthe for ages? Oh well.